The Santo Niño de Atocha is an advocation or title of the Holy Child Jesus with origins that reach back to Mexico and Spain. On the outskirts of Madrid in the barrio of Atocha there is an ancient church that houses an image of the Virgin with the Christ Child. This image is known as Nuestra Señora de Atocha, Our Lady of Atocha. According to legend the Christ Child would visit Spanish Christian prisoners of the Moors during the Islamic presence in Spain. Dressed as a pilgrim with a broad-brimmed hat, traveling cloak, and walking staff the Christ Child brought bread and water to Spanish prisoners who were amazed that his basket never went empty and his water gourd never stopped flowing. As the Santo Niño traveled from cell to cell and prison to prison he wore out his sandals. In time it became customary for devotees of the Santo Niño to leave baby shoes at shrines dedicated to him. Many New Mexican survivors of the Bataan Death March attribute their survival to the intercession of the Santo Niño de Atocha. He is a patron of travelers, prisoners, and the ill and crippled. During the late eighteenth century an image of Nuestra Señora de Atocha was brought to a church in Zacatecas, Mexico. At some point thereafter the figure of the Christ Child was removed from his mother’s arms and was placed in a chair. Devotion to the figure soon developed apart from that to his mother. Legends and stories arose which told of the miraculous Child’s peregrinations bringing relief to prisoners and miners in the nearby mines of Plateros and Fresnillo. 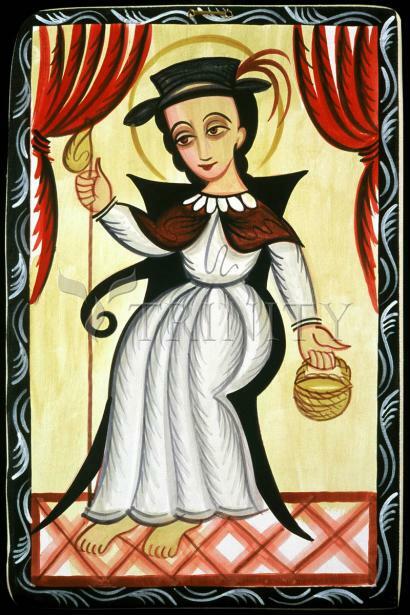 Eventually devotion to the Santo Niño was spread northward to present day New Mexico by Zacatecan colonists. Today a famous shrine called the Santuario de Chimayo in the village of Potrero houses an image of the Santo Niño de Atocha. It draws thousands of visitors annually who seek cures from sacred earth dug from around the chapel. Towards the end of the Moorish occupation, in the city of Atocha, Spain, many Christian Spaniards suffered imprisonment. The Moorish conquerors forbade all persons from entering the prison on errands of mercy with the exception of small children. Not even priests were permitted to bring comfort to the dying. Mothers and wives of these prisoners prayed daily and passionately for divine aid in bringing solace to the captives who lacked sufficient food, water and spiritual consolation. One day a child dressed like a pilgrim of that time came to the prison carrying in one hand a basket of bread and in the other a staff with a gourd full of water suspended at its tip. To the astonishment of the moors, the gourd and the basket of bread were still full after all the prisoners had received a blessing and their portion of food and water. According to legend, Christ had returned as a child in answer to the prayers of the women of Atocha to serve those without spiritual and physical sustenance. Since this time, the image of the infant Christ carrying food and water has been known as the Santo Niño de Atocha (Holy Child of Atocha). The constantly replenishing bread and water symbolize love and faith, says Dr. Irene Soriano, art historian. "Love and faith don't go away and are continuously being replaced," she says. Although this legend is the most widely known, other stories about the origin of the Santo Niño thrive. Another version says that the Marquis San Miguel of Aguayo of Spain gave a statue of the Virgin of Atocha holding Jesus to the church in Plateros, Mexico. Thereafter, the people venerated the child Jesus in his mother's arms and adopted the name of "Atocha" for the Christ Child. El Paso resident Lucila Jasso learned another version of this story as a child. "The statue was actually found in a mine in Plateros, a silver-mining town," she says. Miners found a peculiar iron rock which appeared to have an image on it. After cleaning and polishing the piece, workers discovered the image of the Christ Child in his infancy. They donated the object to the church of Our Lady of Atocha in Plateros, and the name "Atocha" was also applied to the Santo Niño. Jasso also says that the child's name is actually Manuel de Atocha. The name "Manuel" is short for Emmanuel. Meaning "God is with us." Regardless of his origin, the Christ Child is known to help prisoners, the ill and afflicted, to protect children and the family unit, to guard travelers, and to symbolize peace and hope. There are many shrines to honor him. The one in Plateros was first constructed in April 1790 and has since been restored into an ornate sanctuary. Images of the Santo Niño vary in detail and name, but they all represent the Christ Child. He may be honored in his mother's arms, as a traveler sitting in a chair or standing alone. The image may appear as an infant or a child up to 10 years old. When dressed as a pilgrim, he is referred to as the Pilgrim Child, representing the journey of life that begins as a child. He appears to be about one year old and wears a feathered, wide-brimmed hat, long robe, cape and sandals. In his right hand he holds a traveler's staff with a water-gourd at its tip. In his left hand he sometimes holds a silver basket filled with bread, wheat or grapes. The bread and wheat symbolize communion. Another version is the Child in Blue, who appears slightly older than the Pilgrim Child and wears a blue robe signifying heaven. His cape is decorated with a lace collar and a cockleshell, symbol of mementos which Medieval European pilgrims might have brought home. The basket appears in the right hand while the staff now is in the left. An image with dark skin may be referred to as "Niñito Moreno" or "Dark Child." If the Child in Blue carries prisoner's leg irons or they lay by his feet, he is referred to as "Niño Cautivo" or "Captive Child." Santa Fe Museum Director Yvonne Lange tells the story of Don Francisco Sandoval Zapata, who was bringing a statue of the Christ Child to Mexico as a gift from the cathedral in Seville, Spain in 1622. Moors took Zapata and the statue prisoners and carried them to Algiers. Zapata was killed, and his remains, along with statue were ransomed, thus giving rise to the legend of the Captive Child. Many people believe that the Santo Niño performs miracles. A room in his chapel in Plateros is filled with canes, braces and crutches left there by devotees claiming to be healed by the Christ Child. One legend maintains that the statue of the Santo Niño in the chapel at Plateros walks about the valley each night healing the sick. According to parishioners, he disappears from his altar at night and mysteriously reappears the next morning with mud at the bottom of his sandals. Another tale describes a farmer who couldn't find laborers to harvest his wheat. A young man arrived and helped the farmer. The grateful owner placed some golden wheat springs in the hand of his helper, who called himself Manuel de Atocha. This is the reason the Santo Niño carries wheat. Lucila Jasso's husband was born blind. His mother prayed fervently to the Santo Niño to grant sight to her son. She vowed to visit the shrine in Plateros and to name her son "Manuel" after him. Within weeks, baffled doctors told her that her son could now see. Two other generations of "Manuels" followed as a sign of deep appreciation and devotion to God. The followers of El Santo Niño de Atocha firmly believed that the little boy who appeared hundreds of years ago with the bread and water is Jesus, and he still performs miracles today.